This gem of a book, Sadhana the Inward Path by Prof. N. Kasturi, a manual on practical living, is a compilation of Bhagawan Sri Sathya Sai Baba's exhortations picked from His various discourses. 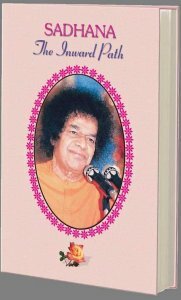 This book gives an opportunity for all to read the divine gems and tread the spiritual path to Light and Love that is Bhagawan. There are in all 469 messages in11 classified chapters, including Role of Guru in sadhana, diet discipline, meditation on Pranava - Aum, 'physical, mental and vocal tapas'.. A useful companion for a true aspirant.